Using brilliantly simple math that illuminates universal emotional truths, Emotional Equations crystallizes some of life’s toughest challenges into manageable facets that readers can see clearly—and bits they can control. Popular motivational speaker and bestselling author Chip Conley has created an exciting, new, immediately accessible visual lexicon for mastering the age of uncertainty. Making mathematics out of emotions may seem a counterintuitive idea, but it’s an inspiring and incredibly effective one in Chip Conley’s hands. 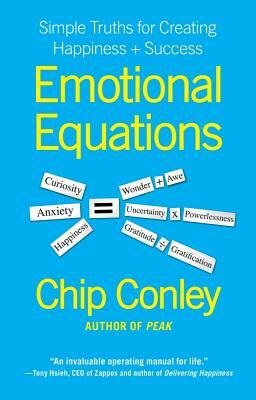 When Conley, dynamic author of the bestselling Peak, suffered a series of tragedies, he began using what he came to call “Emotional Equations” (like Joy = Love – Fear) to help him focus on the variables in life that he could deal with, rather than ruminating on the unchangeable constants he couldn’t, like the bad economy, death, and taxes. Now this award-winning entrepreneur shares his amazing new self-help paradigm with the rest of us. Emotional Equations offers an immediately understandable means of identifying the elements in our lives that we can change, those we can’t, and how they interact to create the emotions that define us and can help or hurt our progress through life. Equations like “Despair = Suffering – Meaning” and “Happiness = Wanting What You Have/Having What You Want” (Which Chip presented at the prestigious TED conference) have been reviewed for mathematical and psychological accuracy by experts. Conley shows how to solve them through life examples and stories of inspiring people and role models who have worked them through in their own lives. In these turbulent times, when so many are trying to become “superhuman” to deal with our own and the world’s problems, Emotional Equations arms readers with effective formulas for becoming super human beings. — George Zimmer, CEO and chairman, Men's Wearhouse, Inc.